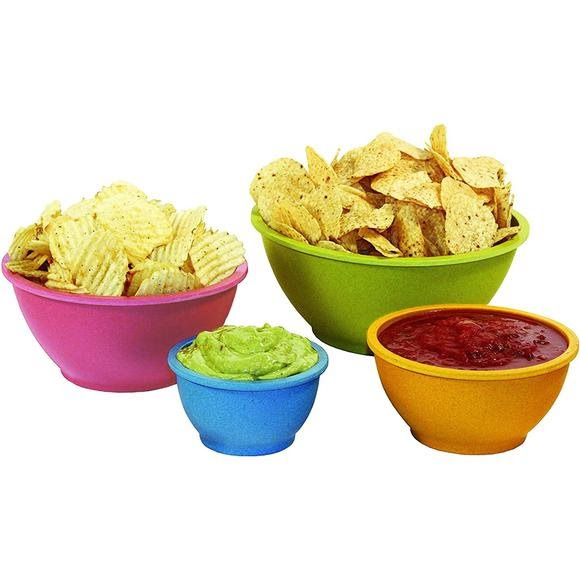 Perfect for backyard parties, family camping or just around the house, this 4-piece bowl set from Texsport is made with Bamboo, a bio-degradable, renewable natural resource that's also dishwasher safe! Chips and salsa not included. Perfect for backyard parties, family camping or just around the house, this 4-piece bowl set from Texsport is made with Bamboo, a bio-degradable, renewable natural resource that&apos;s also dishwasher safe! Chips and salsa not included. Dimensions (packed) Nested: 9" x 4"